HEAVY DUTY PLASTIC CHAMPAGNE BUCKET! 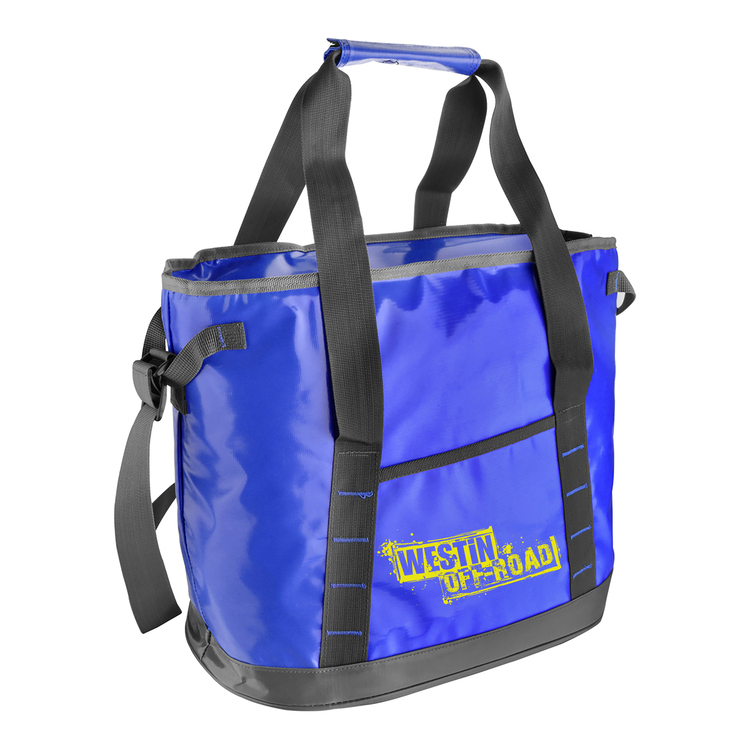 Ideal for Indoor & Outdoor Events! 125 oz. 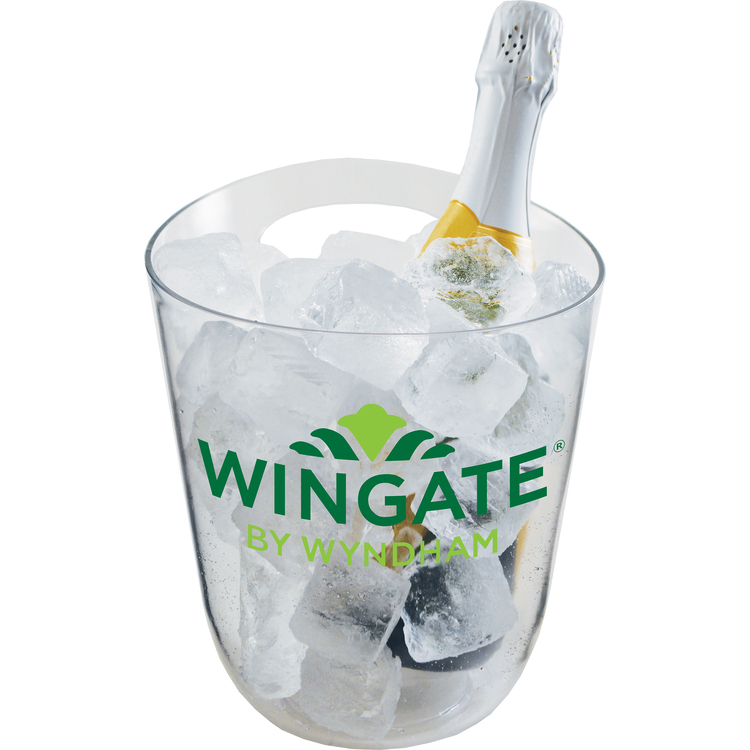 Heavy Duty Clear Plastic Champagne Bucket Made in USA of durable Clear Styrene Plastic and perfect for indoor and outdoor use. Prices include a one color, one location imprint. Multi-color imprint, 2nd side imprint or full color 4”, 5” OR 6” decal imprint available. 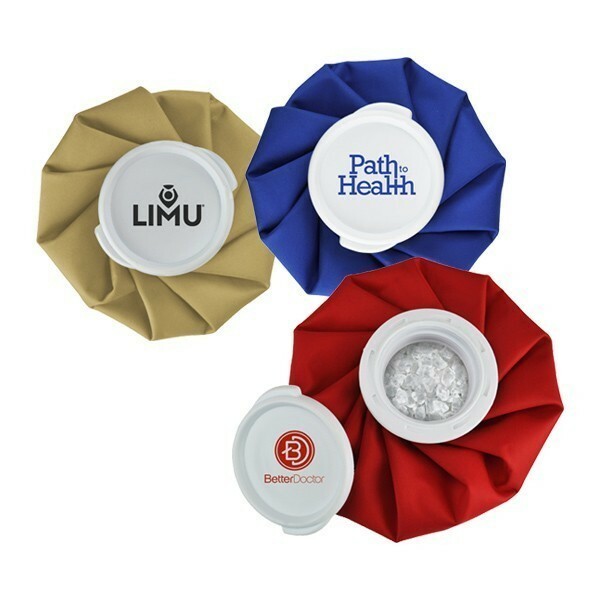 Top rack dishwasher safe (Not dishwasher safe with decal imprint), BPA free and recyclable. Also available in a Light-Up style. LIGHT-UP CHAMPAGNE BUCKET! 8 Stick Dome Colors Available! MAKE YOUR MESSAGE COME ALIVE! 125oz 5-Light, Light-Up Plastic Champagne Bucket. Base lights up with 5 super bright white LED lights with 3 push button controlled lighting effects, spinning, all constant on or all blinking. 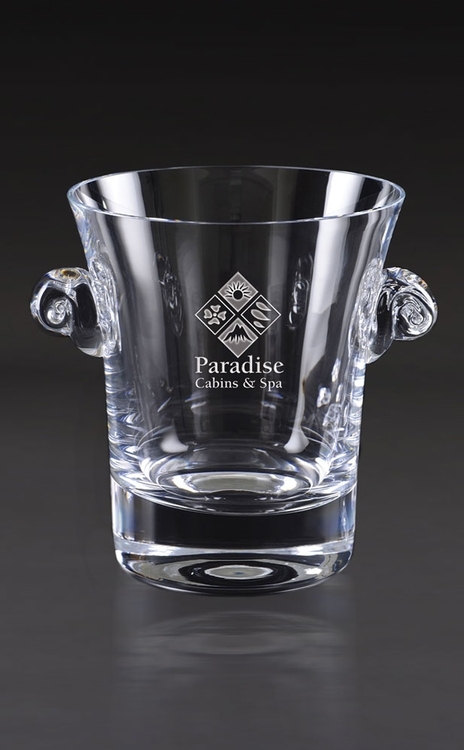 Made in USA of durable clear Polystyrene Plastic. Prices include a one color, one location imprint. Multi-color imprint, 2nd side imprint and full color process imprinting are available. Top rack dishwasher safe, BPA free and recyclable. Replaceable batteries included. The Olann Short Stories pattern is derived from the Irish word for wool and the design is inspired by the famous Aran wool knit sweater and the Aran stitch, which is a 'Diamond Stitch' reminiscent of the small fields on the island. 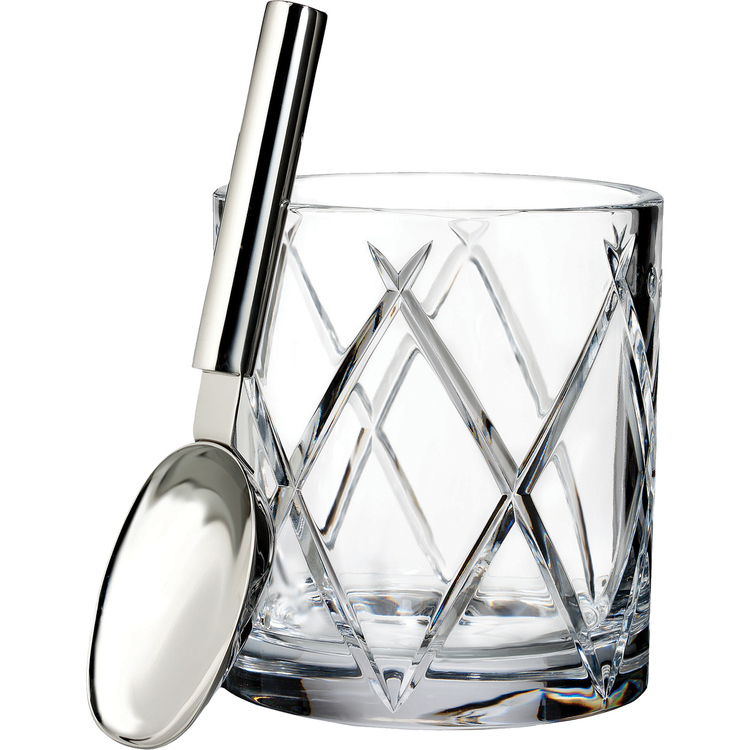 An entertaining essential, the Olann Ice Bucket and Scoop is decorative and functional, presented in classic Waterford packaging. Chill your favorite drink with the Rabbit' Jumbo Chilling Stones. The Rabbit' Jumbo Chilling Stones keep your beverages cold without diluting them. They come as a set of two; however, only one stone is needed to chill each drink. 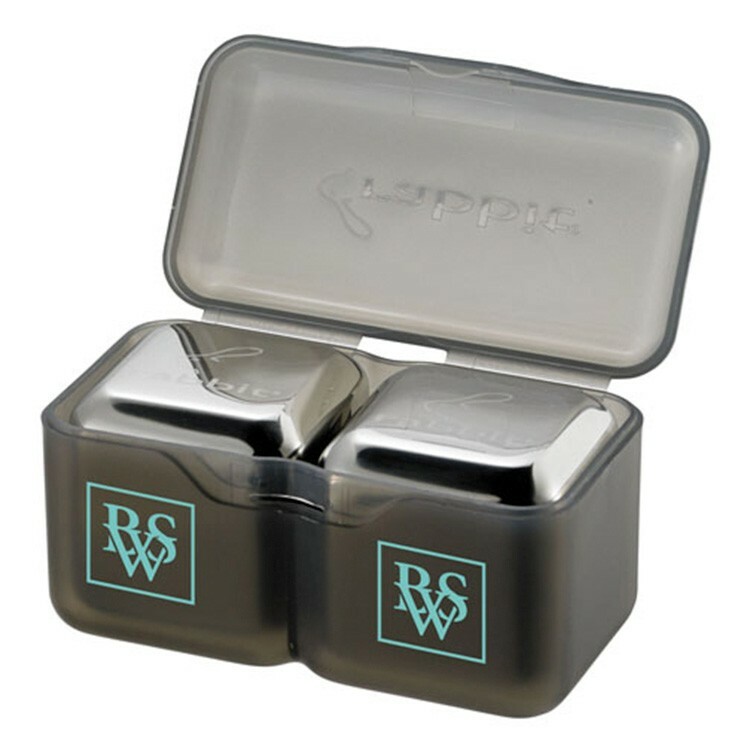 The included storage container keeps your stones clean and secure in the freezer. Works great not only in whiskey but also other liquors, wine and soda. Imprint goes on storage container. Boxed. 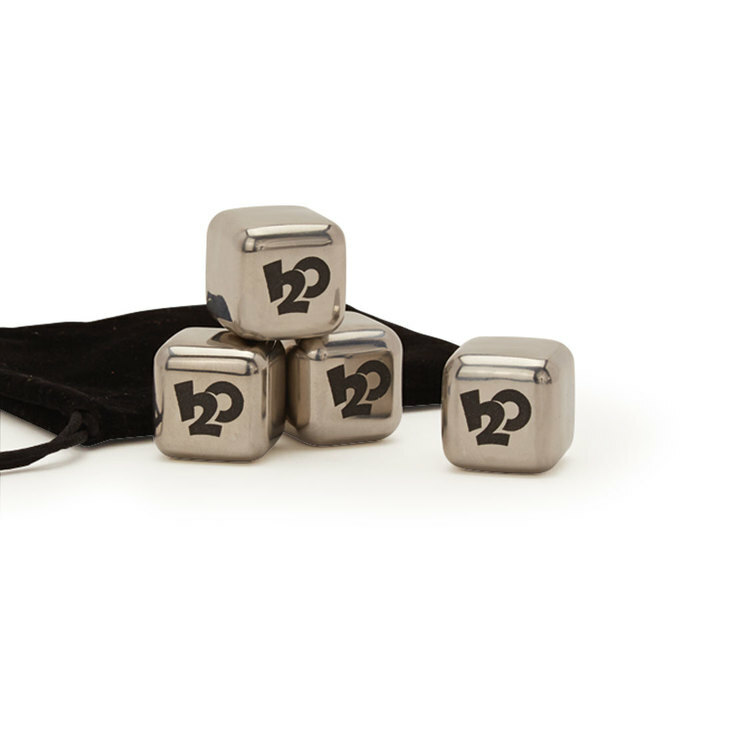 NEW COTTONMOUTH stainless steel ice cubes are sure to cool down your drink and keep it there without it being watered down. Includes a black velvet drawstring bag. 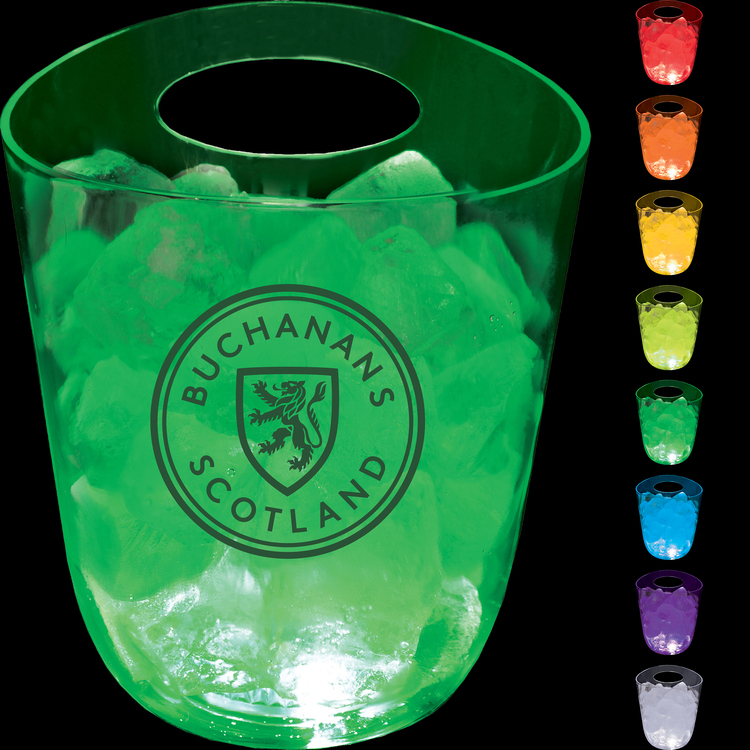 LIGHT-UP ICE BUCKET! 3 and 5 Light Styles Available! MAKE YOUR MESSAGE COME ALIVE! 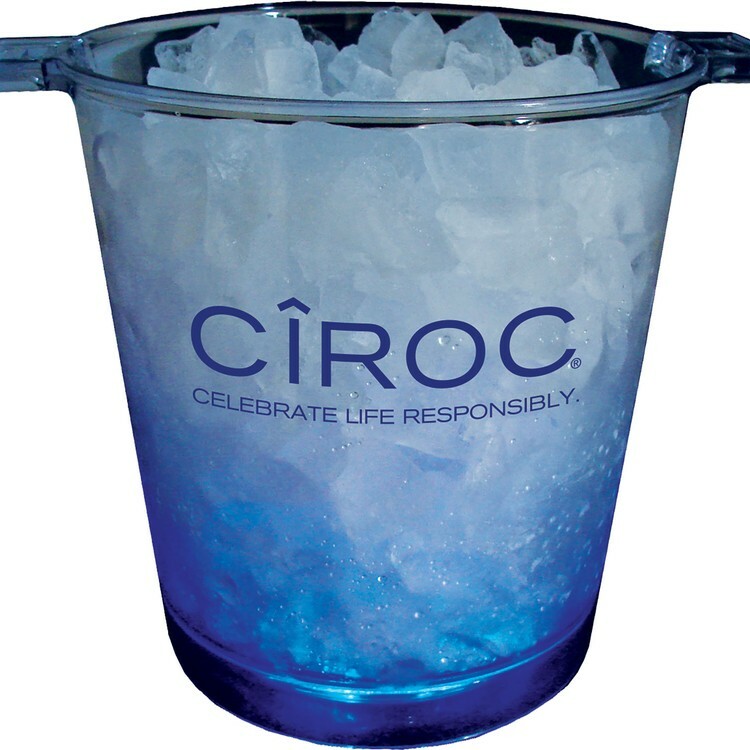 200oz 5-Light, Light-Up Plastic Ice Bucket available in 8 colors. Base lights up with 5 super bright white LED lights with 3 lighting effects, spinning, all constant on or all blinking. Made in USA of durable Styrene Plastic. Prices include a one color, one location imprint. Multi-color imprint, 2nd side imprint and full color process imprinting are available. Top rack dishwasher safe, BPA free and recyclable. Replaceable batteries included. Spoken, written or sung, the Irish are famously verbose & social people known for their warmth, hospitality and generosity. 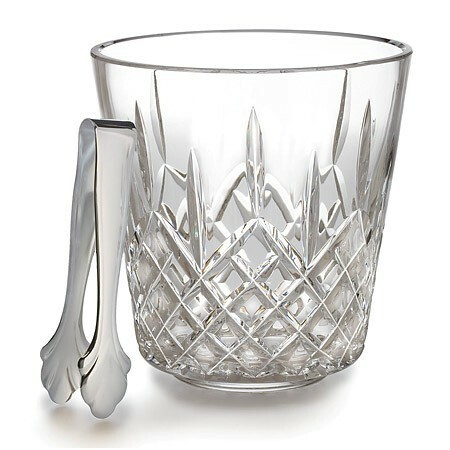 The Aras Short Stories pattern is derived from the Irish word for home and the design depicts a vertical cut representing the striking architecture of the turrets seen in Ireland's many beautiful castles. 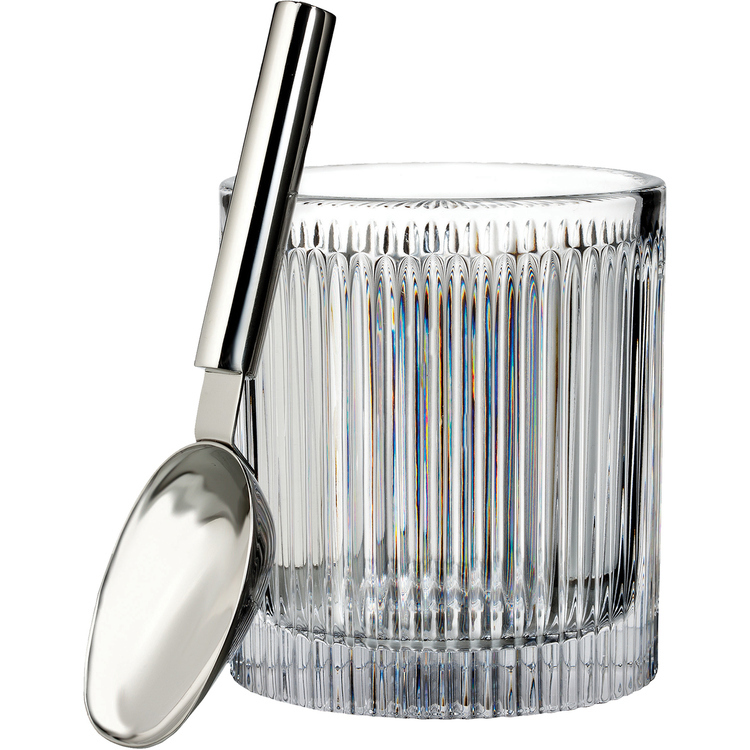 An entertaining essential, the Aras Ice Bucket and Scoop is decorative and functional, presented in classic Waterford packaging. Lismore Essence is a new pattern featuring the signature Lismore cuts on a gracefully curving body. It features the signature open diamond and wedge cuts. Great to mix with your current Lismore pattern too. 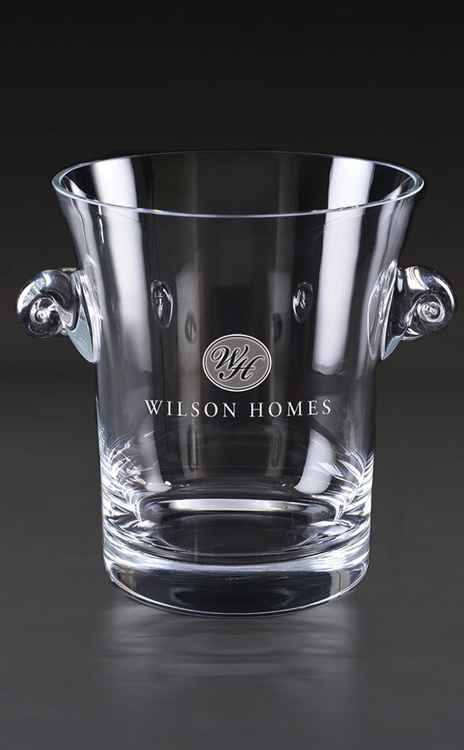 Suitable for engraving. HEAVY DUTY PLASTIC ICE BUCKET! Ideal for Indoor & Outdoor Events! 200 oz. 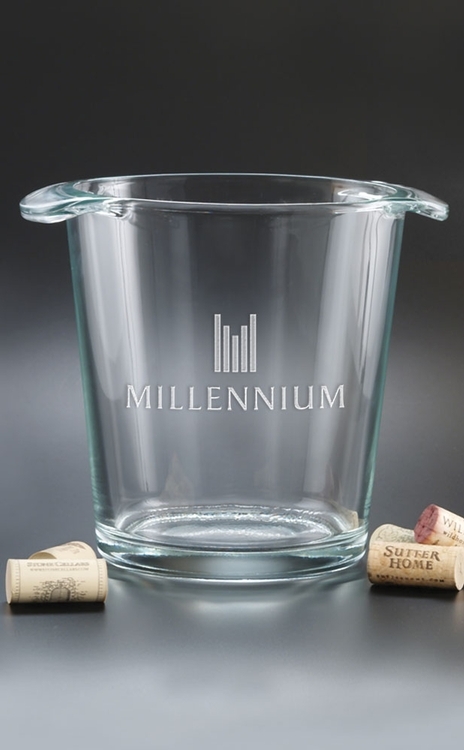 Heavy Duty Clear Plastic Ice Bucket Made in USA of durable Clear Styrene Plastic and perfect for indoor and outdoor use. Prices include a one color, one location imprint. Multi-color imprint, 2nd side imprint or full color 4”, 5” OR 6” decal imprint available. Top rack dishwasher safe (Not dishwasher safe with decal imprint), BPA free and recyclable. Also available in a Light-Up style. 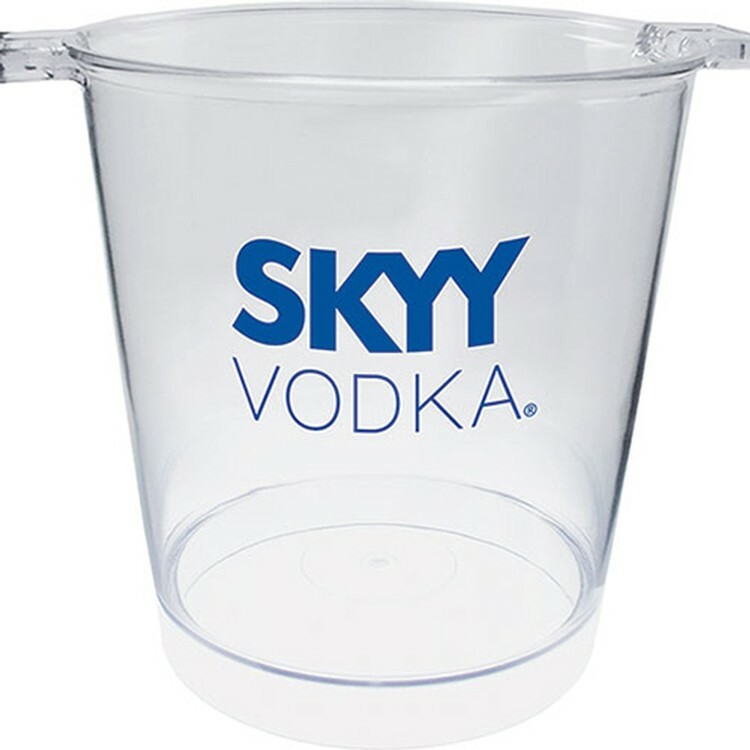 BUDGET PRICED PLASTIC ICE OR PARTY BUCKET! 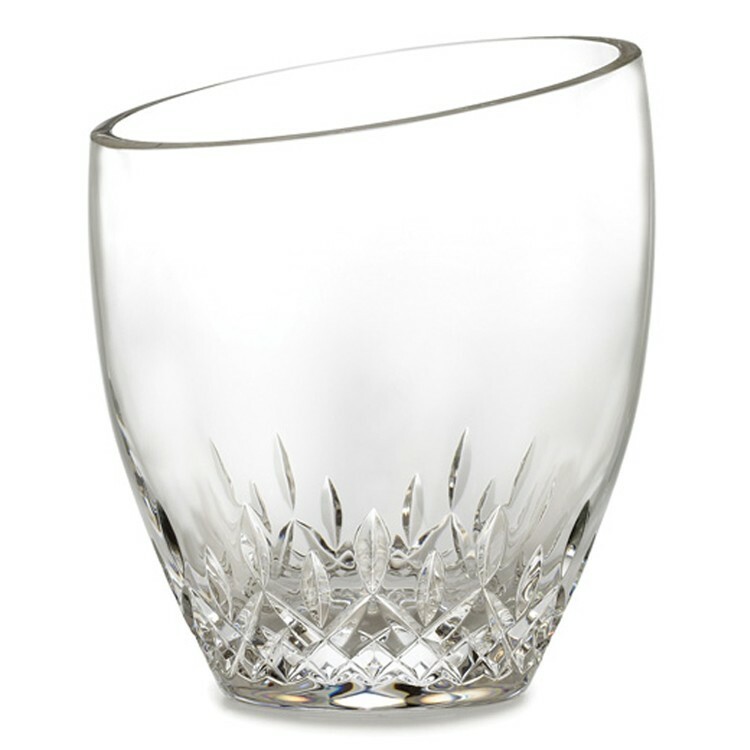 Ideal for Indoor & Outdoor Events! Big 220 oz. 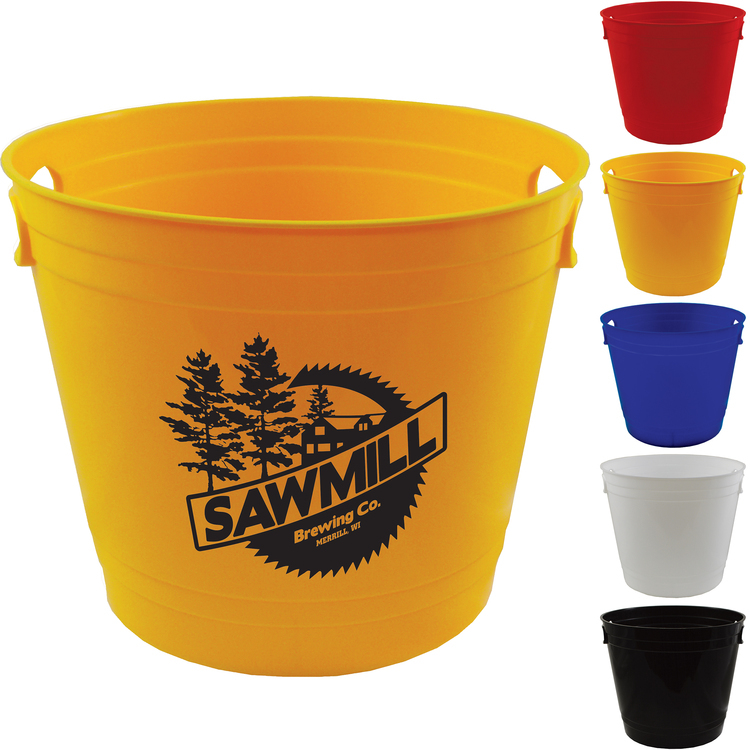 Plastic Party Bucket holds 8 of your favorite bottles and is available in 5 colors. 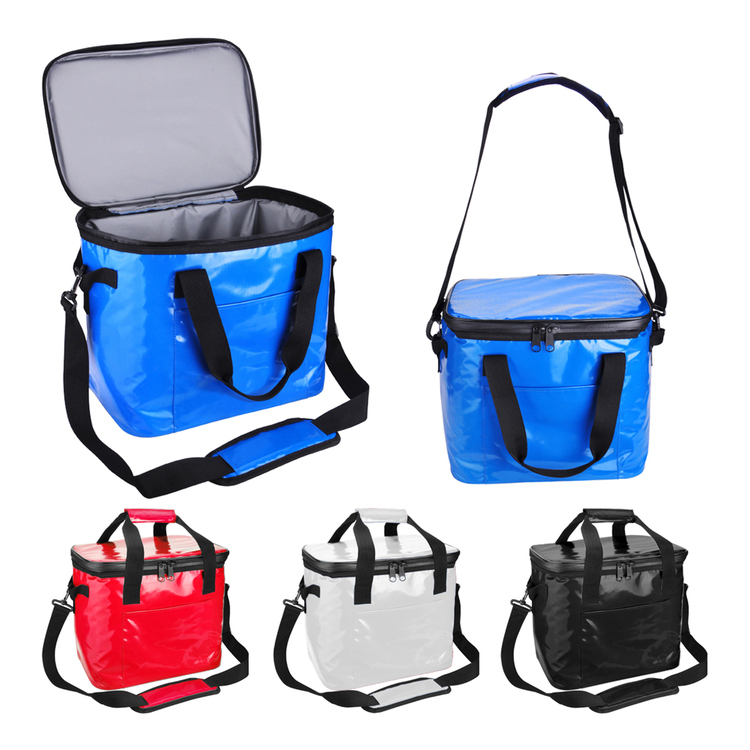 Made in USA of durable Polypropylene Plastic and perfect for indoor and outdoor use. Prices include a big area one color, one location imprint. Multi-color imprint, 2nd side imprint or full color imprint available.